Why de F do they use Western names, Jennifer W, my arse!!! 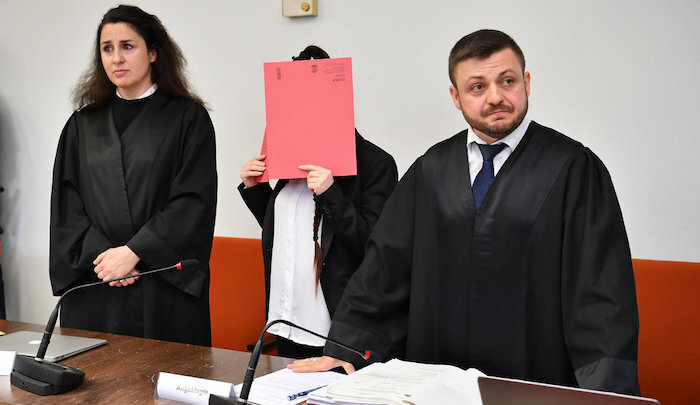 The 27-year-old German woman, identified only as Jennifer W. in keeping with German privacy law, showed no emotion during the 15 minutes it took a judge in Munich to read out the charges against her, which include murder, war crimes, membership in a foreign terror organization and weapons violations. No pleas are entered in German courts and the defendant, wearing a white blouse, black slacks and a black cardigan, declined to make a statement. Her lawyer did not say whether she would say anything during the proceedings, which are scheduled to continue until September. In the case of Jennifer W., prosecutors were helped by her own eagerness to tell the man who offered to drive her as far as Turkey about her life in ISIS. American intelligence officials had tipped off their colleagues in Germany about the woman, allowing the Germans to set her up with a driver, whose car was bugged, German news media reported. She told the driver about leaving her home in northwestern Germany in August 2014, and making her way through Turkey and Syria to Iraq. Once she arrived, prosecutors said, she joined the Islamic State and swiftly rose through the ranks, becoming a member of the Hisbah, the morality police, patrolling the parks of the Iraqi cities of Falluja and Mosul. “Her job was to make sure that women were upholding the terror organization’s dress and behavior codes,” they said. “To intimidate them, she carried an AK-47 machine gun, a pistol and an explosive vest.” In January 2016, she visited the German Embassy in Ankara, Turkey, and the Turkish authorities arrested her. They deported her to Germany, where she was allowed to go free. According to prosecutors, she spent the next two years working to return to ISIS-controlled territory, and found someone to take her most of the way there. She and the driver set out, and she was arrested last June, after telling her story but before they had left Germany.